This week we’re featuring stories of rural revival happening in Holstein, Iowa. 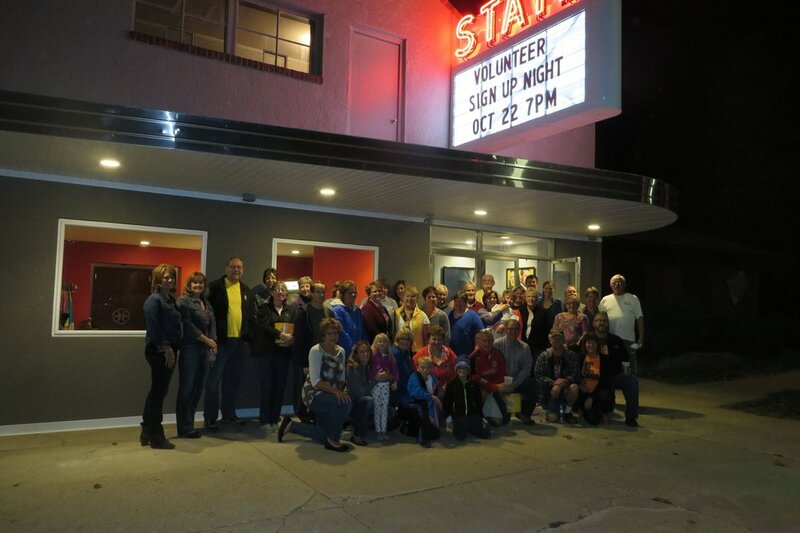 Today’s guest blog post is from Alyssa Dreeszen, Manager of the Holstein State Theatre. Welcome, Alyssa! 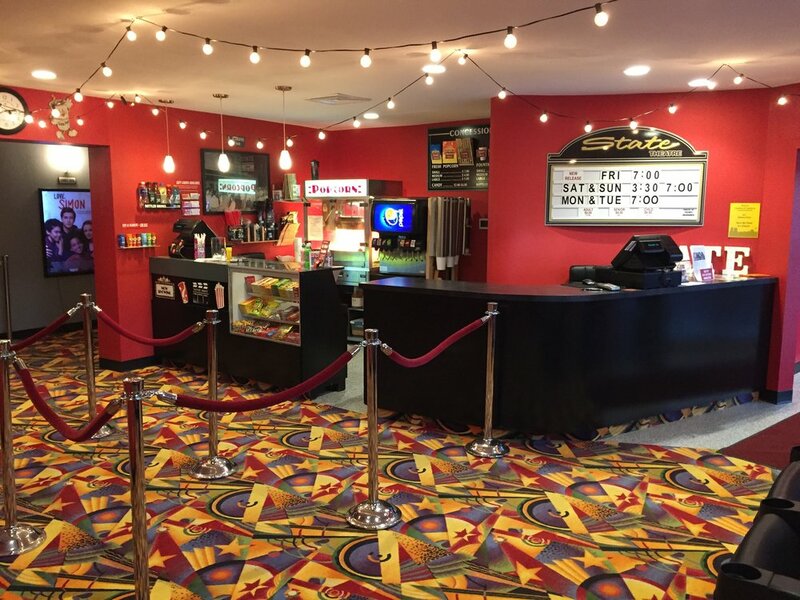 The movement of reopening small town movie theatres is a great example of what communities do. People come together to make something happen, for the town, and acting in good faith. 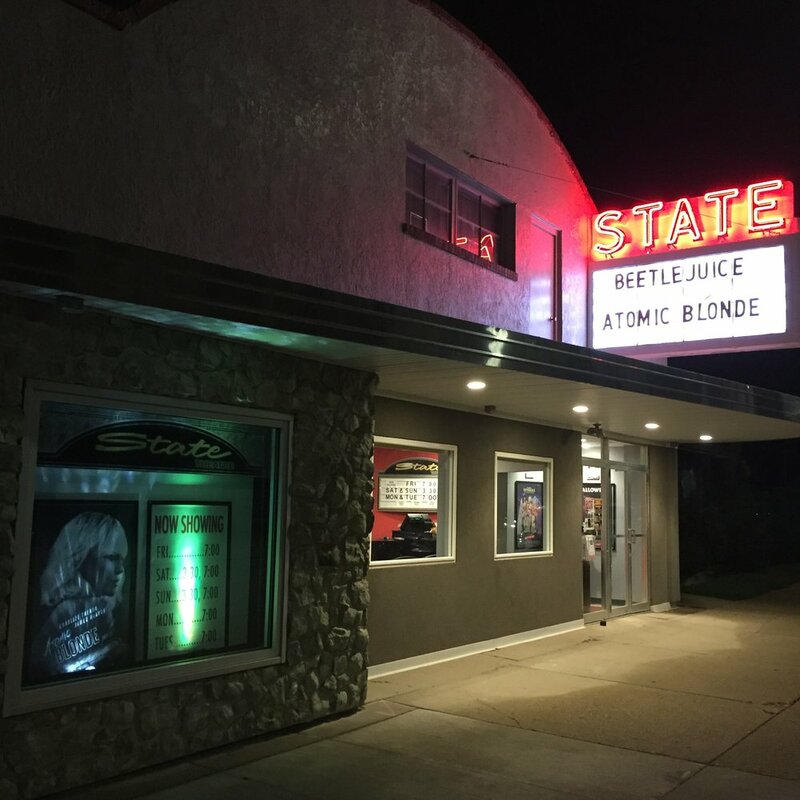 Getting the State Theatre renovated and reopened was just one thing that has happened recently in Holstein, Iowa, but is a big part of the energy and revival going on here. In a short couple of years while working on getting the theatre reopened, three retail stores popped up in town, a hotel and truck stop were built, and a coffee shop opened, among other changes and developments. It started with a couple business owners in town on a development board, Kathy Vollmar and Brenda Cronin, who saw a need and got after it. The State, as we affectionately call the theatre, had been closed and in disrepair after being a part of Holstein since 1948 (and a theatre had existed in other buildings in Holstein decades before that even). The Holstein Development Authority got an offer to buy the theatre property, and the two co-chairs started a “Save the State” committee. We were a small group and didn’t even take minutes at the meeting, we just got together and it got done. And are still getting it done! 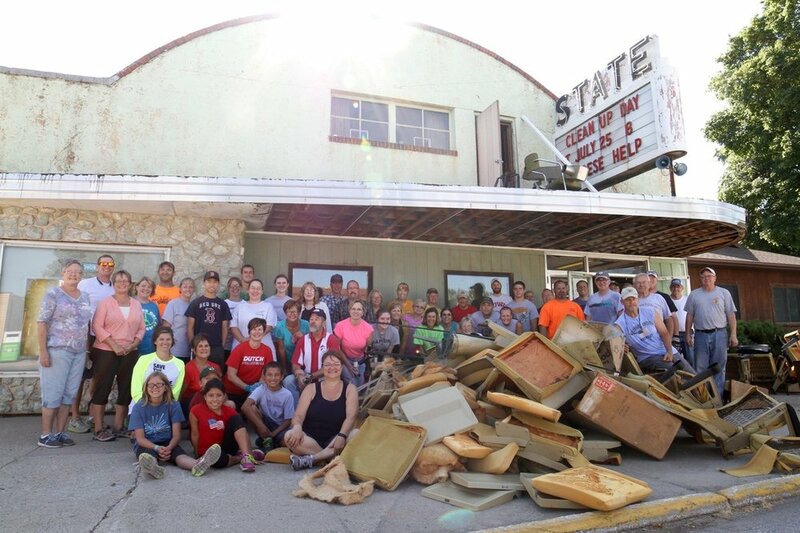 In July of 2015, about a year and a half before we opened, Kathy put up on the theatre marquee “CLEAN UP DAY” “PLEASE HELP” for the very first clean up day to start the renovation process. So many people showed up that the work was done in only two hours. It made for a powerful image, and a message loud and clear to us on the committee, that people believed in this project. With none of us having experience with movie theatres, we relied on information Kathy and Brenda were getting from industry professionals out of Des Moines. I should also mention how important this movement was to our cinema guys, who have since retired, who gave many hours of guidance and work and I believe didn’t charge for it. The goal post moved several times, but we ended up raising around $250,000 and were able to open without any debt. We accomplished this with little donations, big donations, grants, gifts of grain, movies in the park, trivia nights, two piano concerts, and Mother’s Day omelet feeds - each one raising the level of painted yellow packing peanuts, resembling popcorn, on our homemade thermometer in the theatre window. I was the youngest and newest to the community in the “Save the State” group. The group was your mix of people in the community who step up - and I didn’t know it at first, but some were even my next door neighbors. It was hard to hide my enthusiasm, excited when I would get an email about the next meeting at the library. I had a Bachelor of Fine Arts degree in digital filmmaking, and had always had a thing for this theatre building while my now-husband and I were just dating. Things almost silently fell into place when it was time to open the theatre, and I became the manager. Fast forward through construction and reopening to what will be our second anniversary in November. We have a great variety of volunteers who continue to “Save The State” working tickets and concessions with me each weekend. Our attendance has increased over 10% from last year, and I am so proud of that. Because we are not associated with a chain, and being single screen, I am able to show movies differently. We show “National Lampoon’s Christmas Vacation” every Thanksgiving weekend, we have free classic movies and movies for kids, we can play a lineup of Oscar-nominated films during Oscar month, just to list a few ways we’re different. 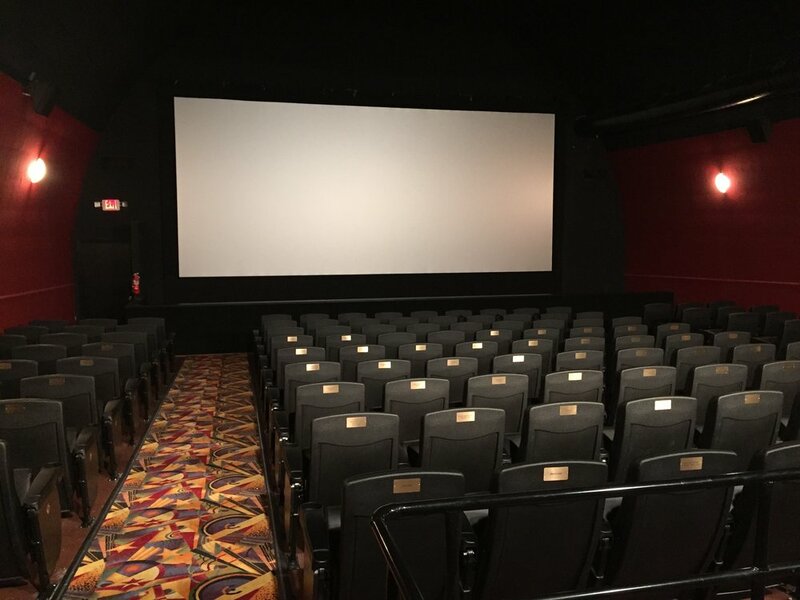 We have more plans in the works to continue to make the theatre better and unique, including renovating the rest of the building behind the screen for use as a party and performance room. My dream is for it to look like the Hogwarts’ Great Hall from Harry Potter, and have an annual wizarding world dinner and a movie event. From the outside, we are a strange looking building, showing second-run movies in a small town - big deal, right? We’re not even able to pay people other than a manager. But we are so much more than that, and I love when you can see that realization on someone’s face when they leave the theatre. Especially when they return as a volunteer. Holstein is one of many small places of incredible possibility. If you are consistent, open, and listen carefully, people don’t just support you - they are literally rooting for you to succeed. Doesn’t that fire you up? Check out the State Theatre website and Facebook page, and find more pictures of the theatre renovation here.